Affirmations and essential oils make these handmade candles musts for those looking to be more mindful. Let's do a mini meditation. Sit in a comfortable position. Take a deep breath in. Hold it for six seconds. Now exhale for another six. Repeat. Be still. Ahhh. Feels good, doesn't it? Now picture doing it with the aroma of essential oil blends wafting all around you, and a thoughtful affirmation to hold in your mind. 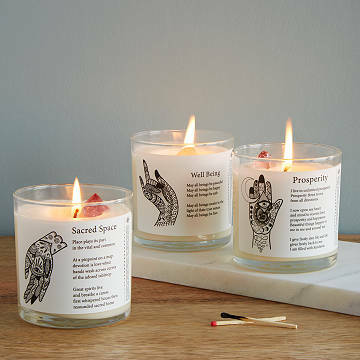 These handmade candles, each with a gemstone hidden inside and its own message of intention, are musts for anyone looking to be more mindful and present in their everyday lives. Go ahead and strike the match. Handmade by Kim Sorden in Colorado. Kim vividly remembers being in a shop with her mother as a child where they mixed each scent as it was requested, glass bottles tipped one after the other as oils combined suddenly to become a scent memory which lasted her whole life. She adored her mother for bringing her there. As a young mother herself Kim's earliest scent memories stirred as she conjured her own candles in the kitchen, with a kit from the local craft store. She found out she had "a natural nose." That first batch of candles at Kim's kitchen table were poured nearly twenty years ago. Now she has poured a couple hundred thousand. Kim attests to what happens when a woman journeys fully from memories of mingling conversations & scents, to a business built by keeping her heart solidly rooted. Every product she offers supports & sustains farmers, artists, friends & community in Colorado. Her storefront on Main Street in Longmont where people now find themselves wandering in, attracted by an unknown longing for scent memories of their own. 3.5" H x 3.25" dia. ; 8 oz. Trim wick to 1/4 inch before lighting. Keep candle free of any foreign materials including matches and wick trimmings. Only burn the candle on a level, fire resistant surface. Do not burn the candle for more than 4 hours at a time. Discontinue use when 1/2” of wax remains on bottom. Never leave a burning candle unattended. Keep wick trimmed to avoid big flame, don't burn longer than 4 hours at a time to avoid overheating. Keep away from drafts, pets and children. The scent and design of the candle are perfect and I will be buying more of them.